Question Recent data suggest that anxiety disorders are as often comorbid with bipolar disorder (BD) as with unipolar depression; however, less attention has been paid to comorbidity of anxiety disorders with BD. Generalised anxiety disorder (GAD) is one of the most prevalent anxiety disorders that is highly comorbid with other mental disorders. We carried out a systematic review and meta-analysis to assess the degree of comorbidity between GAD and BD. Study selection and analysis We searched for all studies, which included primary data concerning the existence of GAD in patients with BD. The literature search strategy, selection of publications and the reporting of results have been conducted with PRISMA guidelines. The meta-analysis calculated prevalence estimates using the variance-stabilising Freeman-Tukey double arcsine transformation. We applied the inverse variance method using both fixed-effects and random-effects models to estimate summary effects for all combined studies. Heterogeneity was assessed and measured with Cochran's Q and I2 statistics, respectively. Findings The current meta-analysis analysed data from 28 independent studies and a total of 2975 patients from point prevalence studies and 4919 patients from lifetime studies. The overall random-effects point prevalence of GAD in patients with BD was 12.2% (95% CI 10.9% to 13.5%) and the overall random-effects lifetime estimate was 15.1% (95% CI 9.7% to 21.5%). Both estimates reported significant heterogeneity (94.0% and 94.7%, respectively). Conclusions Published studies report prevalence rates with high heterogeneity and consistently higher than those typically reported in the general population. It is believed that comorbid GAD might be associated with a more severe BD course and increased suicidality, and it is unknown how best to treat such conditions. 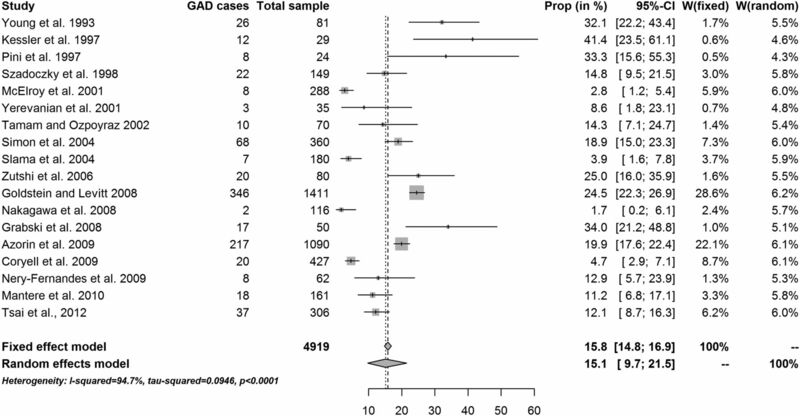 The current meta-analysis confirms that GAD is highly prevalent in BD and the rate is higher in comparison to those in the general population. Comorbidity has been described as the presence of more than one disorder in a person in a defined period of time.1 Psychiatric comorbidity is reported to be a common phenomenon in patients with bipolar disorder (BD). The rates of lifetime comorbidity in BD seem to be higher than 50%2 ,3 and may reach even 70%.4–8 Taking into account the existing substantial overlap between the symptoms of acute BD and those from other mental disorders, it is recommended to diagnose a comorbid mental disorder only if it occurs before the onset of bipolar illness or during periods when mood symptoms are not prominent.9 ,10 This is especially important concerning anxiety disorders which share many symptoms with mood disorders and often put the question whether it is high comorbidity or different facets of the same spectrum of disorders. It is estimated that anxiety disorders are the most frequent disorders in the general population.11 In various studies, generalised anxiety disorder (GAD) comorbid with another mental disorder has been reported at rates equal to 7–32%.12 Until two decades ago, most research had focused on the comorbidity between unipolar depression and anxiety disorders. Less attention has been paid to comorbidity of anxiety disorders with BD. There is convincing evidence that the rates of anxiety disorders are higher among patients with BD compared with their rates in the general population.7 Recent data suggest that anxiety disorders are as often comorbid with BD as with unipolar depression.13 Clinically, it is crucial to identify and treat comorbid anxiety disorders because of their contribution to poor treatment response and recovery, fewer periods of euthymia and higher rates of substance abuse and suicide attempts.12 ,14–16 It is also important to define the comorbidity rate of anxiety disorders in patients with BD because the treatment of this comorbid condition is not straightforward and puts the patient at a high risk to a number of adverse events including higher risk to medication-induced switch. The aim of the current study was to systematically review the literature for data concerning the comorbidity of GAD and BD. We conducted a meta-analysis of the data retrieved so as to arrive at point and lifetime rates of comorbidity. Two authors (KNF and JV) developed the search code investigating the comorbidity of GAD with BD with searches in PubMed/MEDLINE, from inception until 6 June 2015. One reviewer (KNF) screened the titles and abstracts resulting from the search strategy, while a second reviewer (JV) verified. When the inclusion of a study was unclear, the full-text article was screened. This review followed the recommendations of the Preferred Items for Reporting of Systematic Reviews and Meta-Analyses (PRISMA) statement.17 A checklist concerning the PRISMA procedure is included in the online supplementary appendix. Two authors (JV and KNF) used a standardised coding system previously pilot tested to extract the following data from the articles: authors’ names, publication year, location, sample size, criteria for diagnosis, procedure for diagnosis (whether this was conducted by standardised interview, semistandardised interview or clinical decision), number of cases with BD, number of cases with GAD, number of cases with any other diagnostic group which had been used as comparison. 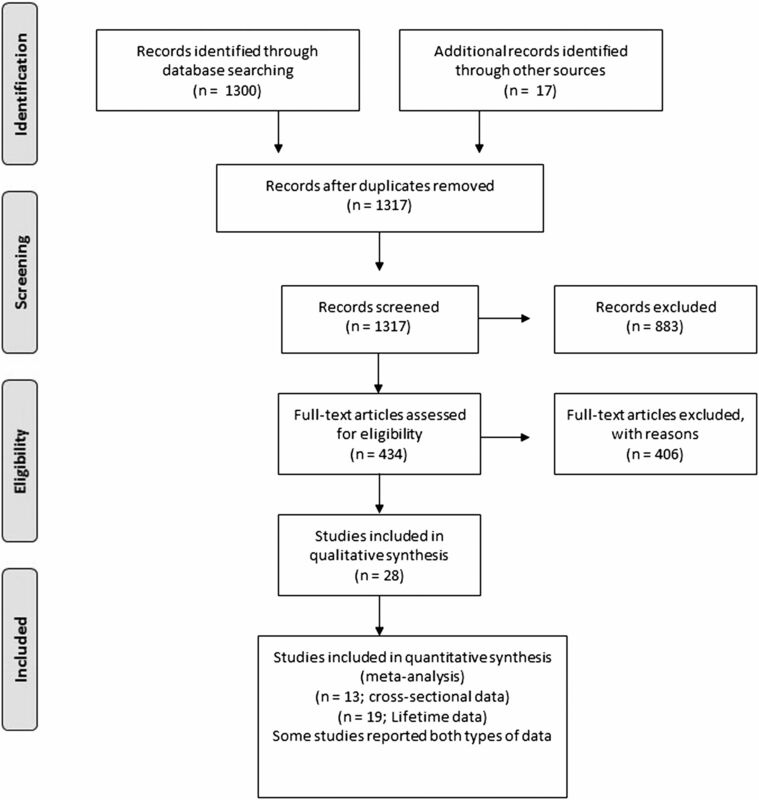 Relevant data from each study were abstracted by one reviewer (KNF) and verified by a second reviewer (JV). Discrepancies in scoring were resolved through discussion. The Baujat plot was used to detect the contribution of each study to the overall heterogeneity.32 The Baujat plot reports on the x-axis the contribution of each study to the overall heterogeneity, while on the y-axis is reported the influence of each study on the overall treatment effect, calculated as the standardised difference of the overall treatment effect with and without each study. To control for adequacy of the models and the identification of outliers, we used the radial plot33 ,34 and the standardised residuals plot35 in relation to the random-effects model. For a random-effects model, the radial plot shows the sampling variance of the observed effect size or outcome against the amount of heterogeneity as estimated based on the model. As far as the standardised residuals plot is concerned, if a study fits the model, its standardised residual follows (asymptotically) a standard normal distribution. A large standardised residual (>2 SD) for a study therefore may suggest that the study does not fit the assumed model (ie, it may be an outlier). When possible, differences in prevalence according to characteristics of individuals or of studies were estimated by comparing prevalence between subgroups of studies. We used metaregression techniques to evaluate the impact of clinical variables: gender ratio, mean age of the sample, diagnostic procedure. Subgroup analysis was applied to estimate the impact of study characteristics: subtypes of BD, on prevalence rates of generalised anxiety. The initial MEDLINE search retrieved 1300 articles, whereas another 14 papers were identified from other sources. Eventually 30 papers were eligible (7 studies from the MEDLINE search and 23 from other sources). Fifteen of them included data with cross sectional prevalence.6 ,12 ,38–50 However the Simon et al studies12 ,49 ,50 include up to the first 500 patients from the STEP-BD study while the Otto et al46 includes the first 1000 patients from the same study. Therefore in the current analysis only the Otto et al.46 study was utilized. Thus 13 studies were eligible for the analysis for point prevalence.6 ,12 ,38–48 One of the Simon et al studies12 was used only to calculate the comorbidity rates separately for BD-I and BD-II patients. Another 19 papers contained data concerning the lifetime prevalence2 ,6 ,12–14 ,16 ,47 ,48 ,51–61 and were included in the analysis. However, the Rihmer et al., 200158 reported data that also were reported in Szadoczky et al., 1998,60 and data from Rihmer et al., 200158 was used only to calculate the comorbidity rates separately for BD-I and BD-II patients. Overall data from 28 independent studies were used in total. The PRISMA flowchart is shown in figure 1 in the main manuscript. In detail the PRISMA flowchart is shown in figure 1 while a list of the studies used for the analysis can be found in the web appendix. Sample sizes varied widely across studies (N=20–918 in studies with point prevalence estimates; 24–1411 in studies with lifetime estimates) and females were over-represented. The mean age was 37 (range 30–43) in point prevalence studies and 38.9 (range 30–44) in lifetime studies (figure 2). In studies with point prevalence estimates, the Structured Clinical Interview for Diagnostic and Statistical Manual of Mental Disorders (DSM)—SCID was applied in 12 studies to derive the diagnosis, and just one applied the Schedule for Affective Disorders and Schizophrenia—Lifetime version (SADS-L; table 1). In studies with lifetime estimates, the SCID was applied in 10 studies, while 9 studies applied other standardised procedures to draw the diagnosis (see table 2). Sample size of studies on the prevalence of generalised anxiety disorder in patients with bipolar disorder. The fixed-effects point prevalence estimate of GAD in patients diagnosed with BD was 9.6% (95% CI 8.5% to 10.7%). The overall random-effects point prevalence estimate of GAD in patients diagnosed with BD was 11.5% (95% CI 6.6% to 17.4%; figure 3). Heterogeneity was substantial: I2=94.0% (95% CI 91.2% to 95.9%; table 3). Reanalysis of data without one outlier study gave a fixed-effects point prevalence estimate equal to 12.2% (10.9% to 13.5%), with no statistically significant change in the random-effects estimates: 12.9% (8.2% to 18.6%). This later value should be considered to be the most appropriate to consider as the cross-sectional estimate. The fixed-effects lifetime estimate of GAD in patients diagnosed with BD was 15.8% (95% CI 14.8% to 16.9%). The overall random-effects lifetime estimate of GAD in patients diagnosed with BD was 15.1% (95% CI 9.7% to 21.5%). Again, lifetime prevalence of GAD varied across studies, depending on the characteristics of the samples (figure 4). Heterogeneity was substantial: I2=94.7% (95% CI 92.8% to 96.0%). The results suggest that the random-effects model was more appropriate for this data set. There was a trend for samples with BD type I to have a higher lifetime prevalence of GAD, while samples with BD type II had a trend for a lower lifetime prevalence of GAD (20.1% vs 12.5%, table 3). Point prevalence of generalised anxiety disorder (GAD) in patients with bipolar disorder−W=individual study weight in both models. Lifetime prevalence of generalised anxiety disorder (GAD) in patients with bipolar disorder−W=individual study weight in both models. Although the literature is somewhat consistent concerning the overall high rates of comorbidity in patients with BD, it is inconclusive concerning the rates of specific comorbid disorders. Methodological issues include the characteristics of the population being studied and the method of assessment. Epidemiological studies in the general population often use trained lay interviewers while clinical studies often use only highly experienced researchers. Thus, clinical samples are more reliably evaluated, but they might include patients with a more severe form of the illness. In contrast, general population samples have problematic assessment, which is done almost always with the use of structured interviews. This often leads to an artificial inflation of rates, because of false allocation or multiple allocation of the same symptom.18 However, some authors argue that population-based studies provide a better estimation of comorbidity rates compared with studies carried out in primary and secondary care settings, because the latter strategy introduces the bias of treatment-seeking into the sample.7 The current meta-analysis used data from 28 independent studies corresponding to a total of 2975 patients from point prevalence studies and 4919 patients from lifetime studies. It reports that the most probable point prevalence of GAD in patients with BD is 12.9% (irrespective of BD type), while the lifetime prevalence is 20.1% in patients with BD-I and 12.5% in patients with BD-II. It is worth noting that in most studies point prevalence was a 12-month prevalence and, because GAD is a chronic and relapsing disorder, this is probably the reason why point and lifetime prevalence resulted to be very close to each other in our analysis. In some instances, ‘point’ prevalence was higher than ‘lifetime’ prevalence as a result of different methodology, different quality of study samples and bias in the retrieval of information concerning past symptomatology. One interesting and also important feature of this study is that only one-quarter (7 out of 30) papers were identified through the MEDLINE search while the rest were identified by the careful and laborious scanning of reference lists of review papers and books. The reason for this is not entirely clear, but at least partially it is because the data were hidden in studies with different aims and scope; therefore, the key words did not work. This leads to two inevitable conclusions: first, one could not be sure that more such studies exist and remain to be identified, and second, the reliability and validity of review and meta-analytic studies, including the current one, is problematic. An important methodological limitation concerns the method most studies used to diagnose comorbid disorders. Although a comorbid anxiety disorder should only be diagnosed in BD if its symptoms occur independently of mood symptoms, this was probably not the case in most studies which probably used a simple DSM criteria approach. It is important to note that in no DSM edition is there a requirement for symptoms and diagnosis to be independent; therefore, in most instances, it is highly likely that GAD symptoms overlapped with those of BD. In conclusion, this meta-analysis confirms that GAD is highly prevalent in BD and the prevalence rates are higher than those reported in the general population, but it also highlights the great variations in rates among studies. Identifying and treating GAD can be clinically significant in order to lessen BD severity, improve response to treatment of manic or depressive symptoms and reduce suicidality.
. Critical issues in the evaluation of comorbidity of psychiatric disorders. Br J Psychiatry Suppl 1996;30:9–16.
. Bipolar disorder and comorbid axis I disorders. In: Tohen M, ed. Comorbidity in affective disorders. New York: Marcel Dekker, 1999: 229–39.
. Bipolar disorder: an evidence-based guide to manic depression. Springer, 2015.
. Manic-depressive illness. 2nd edn. New York: Oxford University Press, 2007.
. Transformations related to the angular and the square root. Ann Math Stat 1950:4.
. The inverse of the Freeman-Tukey double arcsine transformation. Am Stat 1978:32.
. Conducting meta-analyses in R with the metafor package. J Stat Softw 2010:1–48.
. Meta-Analysis with R. R package version 3.7-1, 2014.
. R: A language and environment for statistical computing. Vienna, Austria, R Foundation for Statistical Computing, 2013.
. Anxiety comorbidity and quality of life in bipolar disorder patients. Can J Psychiatry 2007;52:175–81.
. Differences in Axis I and II comorbidity between bipolar I and II disorders and major depressive disorder. J Clin Psychiatry 2006;67:584–93.
. Prospective 12-month course of bipolar disorder in out-patients with and without comorbid anxiety disorders. Br J Psychiatry: J Ment Sci 2006;189:20–25.
. Comorbidity of anxiety disorders in patients with remitted bipolar disorder. Eur Arch Psychiatry Clin Neurosci 2006;256:428–36.
. Comparing anxiety disorders and anxiety-related traits in bipolar disorder and unipolar depression. J Psychiatr Res 2003;37:187–92.
. Lifetime anxiety and substance use disorder comorbidity in bipolar disorder and its relationship to selected variables. Gender and bipolar subtype differences in comorbidity. Arch Psychiatry Psychother 2008;3:5–15.
. Prevalence of anxiety disorders comorbidity in bipolar depression, unipolar depression and dysthymia. J Affect Disord 1997;42:145–53.
. The prevalence of major depressive and bipolar disorders in Hungary. Results from a national epidemiologic survey. J Affect Disord 1998;50:153–62.
. Empirically derived subgroups of bipolar I patients with different comorbidity patterns of anxiety and substance use disorders in Han Chinese population. J Affect Disord 2012;136:81–9doi: 10.1016/j.jad.2011.08.015.
. Obsessive compulsive disorder: comorbid conditions. J Clin Psychiatry 1994;55(Suppl):15–27.
. Prevalence and impact of comorbid anxiety and bipolar disorder. J Clin Psychiatry 2006;67:5–7. Contributions KF and AP conceptualized and designed the study. AP, and JV drafted the manuscript. AP, JV, AAV, TBHM, and KF critically reviewed the manuscript as submitted. Funding AAV is funded by the Banting Postdoctoral Fellowship Program from the Canadian Institutes of Health Research.